My entire trip to Europe was based on one major key piece - spending some well-needed quality time with my Grandma Heidi. My grandmother is one of the most brilliant and fabulous women anyone may ever meet and she lives in one of the most gorgeous parts of Germany which is where my travels began. In many ways, I needed this trip and I like to think my grandma needed it too. Most of my time spent with her consisted of hiking, long thoughtful conversations and the delicious plethora of foods and drinks. It was needless to say a moment I will always cherish in my life. After flying into Frankfurt we drove to my grandma's small town about an hour southwest of Frankfurt. The town is named Gau-Algesheim and is nestled in the rolling hills and mountains of the German wine land. To paint this picture more clearly picture Napa Valley in the United States and throw in some wicked steep mountains. This region is well known as it is one of the gorgeous stretches off of the Rhine River where Germans grow a majority of their wines because of the awesome fertile and rocky soil. Towns, roads, vineyards, and castles line the Rhine River and cut through these rocky vineyard covered mountainsides. It's so lush and breathtaking it's difficult to truly capture its essence through mere words, but I cannot recommend traveling this area enough. The perfect time to travel here is during the Spring and Summer months. I've traveled to Germany during both times, but my preferred time is Spring as the temperatures stay a bit cooler especially when you're outside so often the July and August months can get quite excruciating! If you'd love to travel to this area I recommend staying in the town of Boppard, Germany. 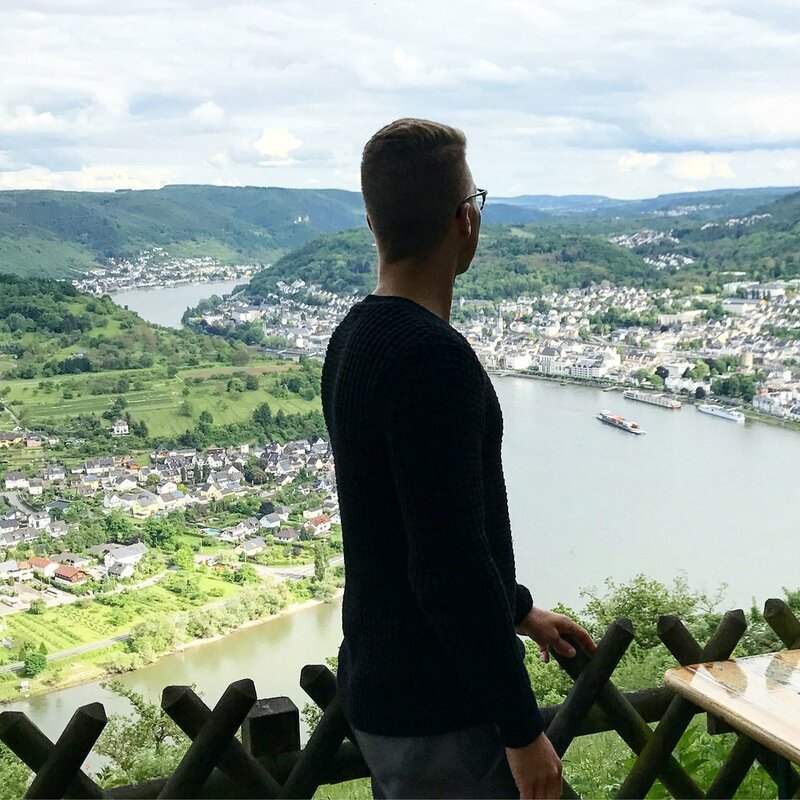 It has wonderful restaurants, shopping, and hiking trails and is well-known for their location as it's housed in a unique spot where all four sides of the Rhine River can be viewed at one time. While in Boppard one of my favorite restaurants worth checking out was inside the beautiful Bellevue Rheinhotel. I ordered their fish with couscous and it was absolutely incredible. I also recommend ordering one (or two... or three...) of their house specialty drinks made of bubbly and an alcohol-infused grape. The name has slipped my mind, but it's fantastic! For fun you can also take the Sesselbahn ski lift up the mountainside and once at the top you can see out across this beautiful scenic area - it's unbelievable and you will not regret a second of it. There is also Restaurant GedeonsEck at the top of the mountainside which is great for a quick bite to eat and/or drink while admiring the unbelievable view. 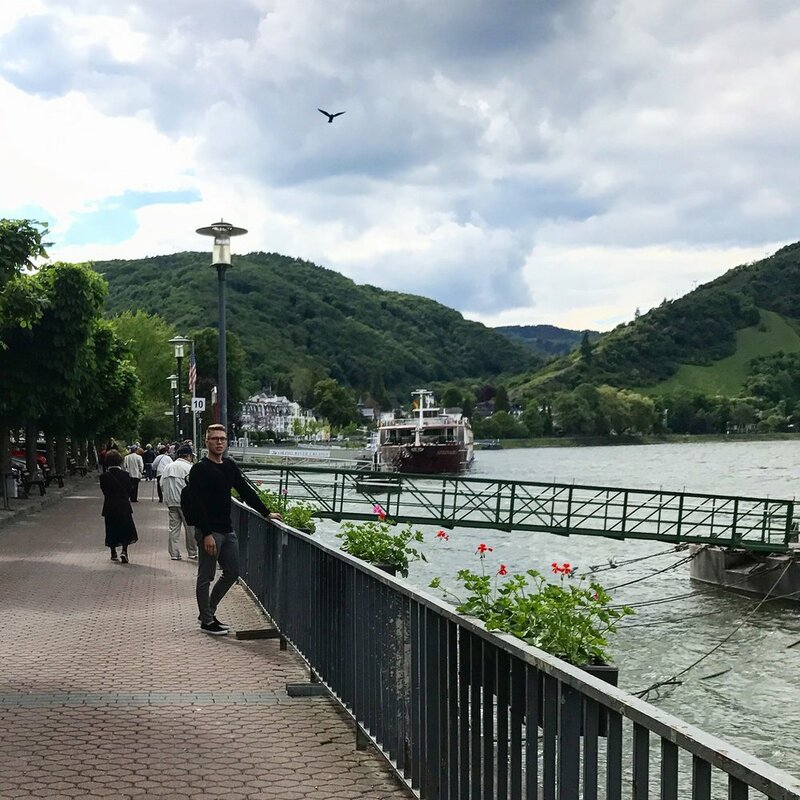 To access Boppard and all the connecting towns you can either take the train or boat both of which are extremely reliable and inexpensive. The train is most helpful while visiting the neighboring towns that house more castles off the Rhine so you are able to hop from town to town with ease. I took a KD Rhine boat starting in Bingen all the way north ending in Boppard which is great if you want some awesome shots of the towns and castles from the water! The entire boat trip was about two hours long and is well worth the time. Germany is one of my favorite countries in the world. The culture and customs celebrated over the many years still carry on until this day and the people are so warm and inviting. The food is delicious - yes, even the surprising amounts of vegetarian and gluten-free options available in the cities and towns. This has now been my second trip to Germany and I plan to make it a regular trip moving forward as it has a special place in my heart. It's rare to have such ties anymore with family where your ancestors are from so for me there is such a vital component in making sure I hang onto that forever!